Whether it is a kestrel hovering over a verge or a Red Kite hanging in the thermals, a glimpse of a raptor is always a special moment. My closest encounter with a wild raptor was walking through my hometown of Wimborne one Sunday afternoon and seeing a Sparrow Hawk feasting on an unlucky pigeon a few metres in front of me. Managed to get very close just before it flew off. Thankfully raptors have a lot more protection nowadays but they are still subject to persecution in certain parts of the country. However, there are some of these magnificent creatures that are very elusive; the goshawk is one of those and Conor Mark Jameson has made it his mission to try and find these beautiful birds wherever he can. His travels will take him from a stuffed one in a museum to the city of Berlin where Goshawks are thriving and back and forwards across the country in search of these birds and eventually to America where he seeks out the birds there and discusses the Native American beliefs about these and other raptors. Friends and other bird watchers keep him up to date with local sightings, though most seem to be sparrow hawks when the evidence is evaluated. I really enjoyed this book, and particularly liked the way he has written it as a diary. His enthusiasm is infectious as he seeks these birds out. They take a lot of finding too, they are not naturally gregarious, preferring to live in copses and woodlands and rarely make themselves visible, so they may be there and you are not going to see them. 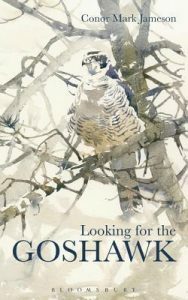 Now I really want to read TH White’s book on the Goshawk.